Olga and Joseph Hirshhorn are considered to be the most dedicated collectors of American art. 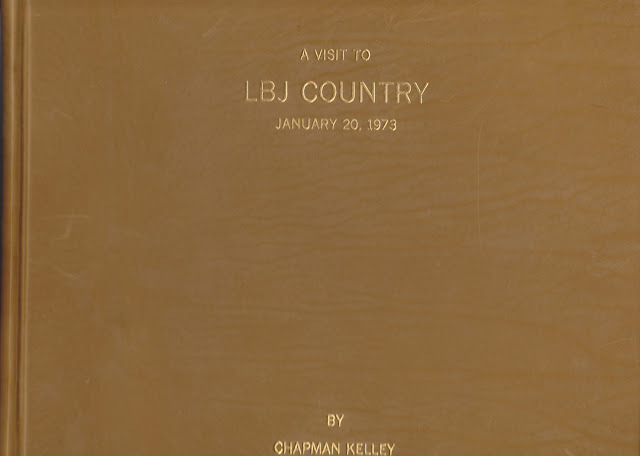 On their way home to Connecticut in 1972, they first stopped in Texas to visit with President Lyndon B. Johnson and his wife Lady Bird at the LBJ Ranch. In the wake of their ranch visit I gave the Hirshhorns a tour of my Fairmont St. building. 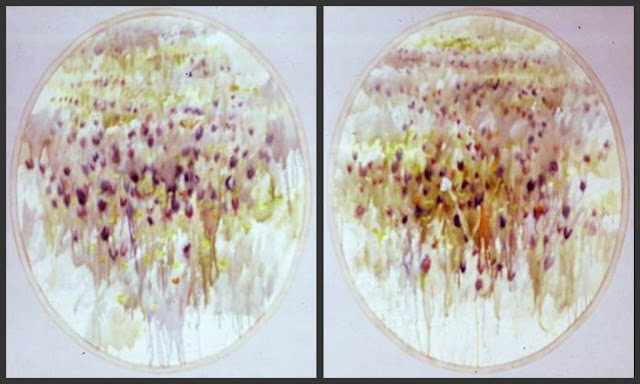 In the upstairs gallery they happened upon a horizontal diamond shaped canvas with an enclosed ellipse containing a field of wildflowers. Joe immediately said, “I’ll take that. Who painted it?” When I told him I was the painter he apologized to me; until that moment he had only known of me as being a gallerist. Joe couldn’t buy the work anyway because Mary Wells, the wife of Braniff International Airways executive Lawrence Harding, had just purchased it for her New York advertising firm Wells, Rich & Greene. That ad firm introduced Braniff airplanes to a bold color scheme and is responsible for fitting its stewardess’s with attractive uniforms. I then brought Olga and Joe to my studio on Hall St. If I may say so, the studio was one of the best appointed and beautiful, anywhere. At the time I just so happened to have hanging a Kenneth Noland “target” painting and a Frank Stella “squares within squares” work. Joe said that he already had examples of the same periods of both artists’ work. I took that to mean that he was not inclined to buy; I was correct. However, he was interested in the works’ pricing. When I told him they were $25,000 each he let out a hearty laugh because when he had purchased their work from their studios he had to forward them the money to buy stretchers for the paintings. Obviously Noland and Stella had come a long way but back then they were financially strapped for cash. Among more of my work that Olga and Joe saw in my studio, they viewed the scale model of the Standard Oil Building that was scheduled to be erected in Chicago in the 1970s. They also viewed some of my small paintings representing the very large paintings that Bonnie Swearingen (wife of Amoco chairman John E.) wanted furnished for the Amoco Building (formerly Standard Oil Building) lobby walls. Another place I took the Hirshorns was for a tour of the newly built Kimbell Art Museum in Ft. Worth. That’s where I had the pleasure of introducing them to my friend Kimbell director Rick Brown. They had much to discuss about the latest security techniques and more that were planned for the Hirshhorn Museum and Sculpture Garden in Washington D.C., which was then under construction. Joe in turn introduced me to David Rockefeller. He was the first of the renowned Rockefeller family member I met. David happened to be touring North Texas with a group of bankers. The Hirshhorns and I toured the Algur “Al” Meadows art collection with Al and his wife at the Meadow's residence. The morning of November 22, 1963, Atelier Chapman Kelley staff was busy framing the paintings I had made in Provincetown, MA; that work was soon to be exhibited at my second one-man show in New York. As midday rolled around I allowed the staff to take an extended outdoor break to watch President John F. Kennedy’s historic motorcade cruise by. The announced route was near my atelier and within easy walking distance. I felt self conscious because my long beard had not been cut since the fourth of July. My friend the barber Luis Santos had yet to decide what he wanted to sculpt from the bushy mess. I carried a portable radio in hand and wore sunglasses as I stood on an uncrowded sidewalk waiting for the procession of limousines to arrive. There was much joking among us about any number of Secret Service binoculars and guns trained on me—agents were waiting for any threatening move I might make. As the Presidential motorcade came into view I spotted U.S. Vice President Lyndon B. Johnson in it. It was the first time I had ever seen him in person. Some minutes later, sadly, Dallas and the nation would never be the same as JFK and his entourage intersected with downtown Dealey Plaza. Almost a decade later I would meet President Johnson for the first time in my life at his LBJ Ranch. and a smaller pair as their gift to President Johnson and Lady Bird. The work was to hang in the guest room at the LBJ Ranch. Olga obtained some small paintings I had done like those she had seen in the model for her famous collection of miniatures. Months later Joe Hirshhorn approved his gift paintings, the ones he had asked me to create for the Johnsons. It was finally ready to be hung. Joe arranged for me to take the diptych to the LBJ Ranch. On January 20, 1973 I arrived at the LBJ Ranch about 9:00 a.m. Before I actually set foot “inside” the Ranch, I had to negotiate a Secret Service checkpoint. No problem. At the house Lady Bird Johnson greeted me. Shortly afterward LBJ walked in with a rolling gait, not unlike movie actor John Wayne’s deliberate walking style—LBJ was physically almost a giant. Lady Bird seated us. After a few moments she kindly excused herself from our presence. LBJ turned on an array of television sets, three to be exact. He watched them only long enough to learn that Richard Nixon would indeed be reinaugurated that day, the 37th President of the United States. In the course of the day lunch was sent to us in place and Lady Bird would return to help in hanging my diptych painting. Several times Johnson resorted to taking a medicine pill. I had the idea that I was to simply hang the work, exchange a few pleasantries and be gone in short order. What in fact unfolded was a spontaneous day-long conversation with the President! Looking back at the circumstances of that memorable day, Johnson just wanted to talk. Initially Johnson and I discussed the Lascaux Caves of southwestern France where early mankind expressed themselves so well with pictures galore on the walls but with no words. Archeologists have studied that artistic work in order to understand early humans. Johnson particularly responded to the Medici family name as being one of the most famous in history not only because of their involvement in the arts but because of their discernment and connoisseurship in picking the best artists to sponsor. Most of the prominent Florentine gentry supported the artists but the Medici’s picked so well that now because of it tourism is the major industry in bella Firenze or Florence, Italy. I was impressed that LBJ seemed to have not only a good grasp of history as humans became more industrialized, urban and self governing but was able to understand (or at least agree with me) that the people and nations that were most open and supporting of new and challenging modes of artistic expression and vision were often not only more livable but also able to envision in many other ways that humankind must always move forward. It is not incidental that both Leonardo da Vinci and Robert Henri, the great art teacher, spoke of art as intervention and both of them lived by that dictum. It was interesting to follow the agility of Johnson’s mind as we led through the great influence that painter Mondrian and sculptor Brancusi have had on all of the best aspects of design in the 20th century. Practical-minded people are often amazed when asked to consider the applied aspects of the arts. In the course of the day-long visit LBJ and I discussed some of our mutual friends; first of course were Olga and Joe Hirshhorn. It is not an inconsequential thing to have the Hirshhorn name attached as the giver of a gift of art to so public a couple as the Johnsons. I consider it to have been a great honor. We spoke of Tom and Etta Frost who happened to be the Johnson’s guests the previous weekend. Tom’s Frost Bank of San Antonio was at the time believed to be the largest privately-owned bank and Etta Frost’s niece, Joan, was my sister-in-law. Also discussed was Gladys Greenlee Bowman, a co-developer of adjoining lands with LBJ. Bowman was the grande dame of Austin, Texas who started Austin’s Jr. League. She was my aunt Liz’s (Dr. Cole Chapman Kelley’s wife) sister. Gladys’ son Jack was one of the richest men in San Antonio. LBJ and I discussed other mutual friends such as Bonnie and John Swearingen of Chicago as well as a number of Dallas, Houston and San Antonio gentry. Even though Johnson was obviously very strong minded and strong willed he possessed none of the belligerence of today’s ideologue politicians; he seemed sincerely interested in exploring ideas of mutual interest but on which we had entirely different opinions. His civility was a winning trait though I think he avoided discussing the Vietnam War with me because my raccoon beard and clothes signaled that I was opposed to the war. There are some individuals who say that LBJ carried to his grave the firm belief in his escalation of the war in Vietnam. I think otherwise, like what U.S. Secretary of Defense Robert MacNamara later believed, that LBJ’s intelligence told him that he had been wrong; he had to carry the ignominy of that part to his grave. It would also seem to explain Johnson’s decision not to seek reelection as president in 1968. My belief about Johnson’s thinking is based upon his interest in the Free University at Lee Park, which I created, as I had described to him during our visit. I shared with him my experience in bringing together the civic and political leaders of Dallas to meet, with mutual respect, the youth who were part of the 1960s movement. And we did it on the youth’s turf. Everyone agreed that democratic consensus must begin with civil and open dialogue. Isn’t that what LBJ was famous for? I couldn’t help but think that had conciliatory movements like the Free University at Lee Park between the “establishment” and the idealistic youth movement (and shouldn’t all youth be that way?) taken place a decade earlier the Vietnam War could have been avoided. LBJ’s faith in academics is indicated by his trust in education—it must be remembered that a portion of his career includes being a teacher. LBJ must have felt that he had let the country down, just as he had been let down by his advisers, those “best and the brightest” individuals of his administration. It is however LBJ’s choice of subjects of our conversation during that day that causes me to feel confident of my conclusions. Even though at the time I was anti-war, I felt that LBJ’s domestic legislation was the best in history and if the Vietnam War had not given his detractors a reason to take it apart piecemeal LBJ would be considered to be one of the greatest two-term presidents. It was clear that Johnson’s view of the best of human endeavors was for mankind to always move forward—a progressive agenda. His domestic legislation strived to make what he valued a practicality; he sponsored policy changes to education, civil rights for minorities, medical security for the elderly. On balance, reforms in those areas improved his legacy because they have that most treasured ingredient—a lasting effect infused with meaning. When it was brought to LBJ’s attention that Queen Elizabeth, Queen Juliana of the Netherlands, the Israeli and Canadian governments had each vigorously entertained Olga and Joe seeking to obtain the vast Hirshhorn collection of American art for permanent export, LBJ was the prime mover and shaker in securing the collection for the people of the United States. He arranged for the art collection to be housed on the Washington Mall. Bravo LBJ! What more evidence is necessary to cement his legacy as a true champion of the visual arts, certainly a long lasting endeavor? I later learned from Lady Bird that LBJ did know before he died that peace negotiations would soon end the war and the information was to be made public in the near future. I often wonder what Bill Moyers, surely the most trusted journalist since Walter Cronkite, would think of my observations about Johnson given that Moyers served in a number of positions in the John F. Kennedy and LBJ administrations. Limited edition leather bound book of photos of "LBJ Country"
I had the opportunity to provide LBJ some solace; I shared with him the many reasons for the arts’ importance. Those have been at the core of many of my lectures in the past and still are. Interestingly, nine years after LBJ’S death, speaking in the same room at the LBJ Ranch, I found myself giving the same emphasis to Lady Bird and members of the famed Rockefeller family, Lawrence and Mary, on the utmost importance of design and the language of the arts in all human endeavors. That complete freedom of expression is of absolute necessity for all creative persons is evident. We must expect that all liberal democratic societies that desire this freedom will fight for it and then we may expect a meaningful society with the flourishing of the arts. As Robert M. “Mac” Doty said of Dallas having an authentic renaissance in the 1950s and 1960s, we more recently have taken a path of intolerance and have lost our international preeminence in the arts. It hurts to know that even the Dallas Symphony and the Dallas Opera have drastically reduced their performance schedule in the same season. Leadership in the arts has become or at least has the appearance of being a game of musical chairs. The transformation of the arts into commodities has taken its toll and gotten the art world in trouble. We certainly have the precedence of great civilizations of the past to build upon. And recognize that indigenous populations were cut short by invaders’ worship of gold, truly a mistake in the pursuit of materialistic goods over honoring preexisting cultural values. The Dallas – Ft. Worth area is now a large metropolis with far more people and money to erect not just buildings covered with donors’ names but not only have we not even retained or enlarged the necessary appetite and audience who would support the arts and inevitably the artists here as they did decades ago. Intolerance of any kind does not pay in the long run. Certainly it doesn’t belong in the arts where the artist is the central and most essential person. Can’t people realize that if we again support artists with the fairness, freedom and support they deserve it will produce a finer and more real civilization that warfare never will? I hope the powers that be are listening to the current Occupy Wall Street and Occupy Museums movement. Their basic beliefs seem to me to represent the feelings of most fair-minded Americans who strongly believe in democracy. I have in my possession a note from Lady Bird Johnson expressing her gratitude to me for being LBJs very last visitor at their home, the LBJ Ranch, before he died of a heart attack less than 36 hours later. A New York Times reporter expressed an interest in my having been the last visitor, but he never followed up. Below is a personal note from the Hirshhorns to yours truly. The tiny paintings arrived and they are most beautiful. I have not yet hung them as I have to find a special spot---perhaps our home in Florida. Thank you for doing them for me to add to my collection of miniatures. Incidentally, the Greewwich Library is going to show it next November. We sent your large paintings to our home in Florida--rather than store them. They are just stunning. Have the Johnsons called you yet? Below is a 1973 letter from Lady Bird Johnson to the Hirshhorns regarding yours truly. Thank you for giving us the comfort and courage of your heartfelt sympathy. Your message came so soon and meant so much to us all. And now I must tell you something very special. On what turned out to be Lyndon's last Saturday, your beautiful paintings were brought to the Ranch by Chapman Kelley. He propped them up in the living room and Lyndon and I were absolutely enchanted. I love them -- and more importantly they pleased Lyndon very much. They are so light and airy and express the way I feel about this countryside in April. They pleased Lyndon very much and I am grateful that you made him happy then, and so often in the past. Note: All of the above is copyrighted material, all rights reserved. Permission for use will be considered upon written request. Blog comments are encouraged, the use of actual full names is strongly recommended, as are affiliations with organizations.